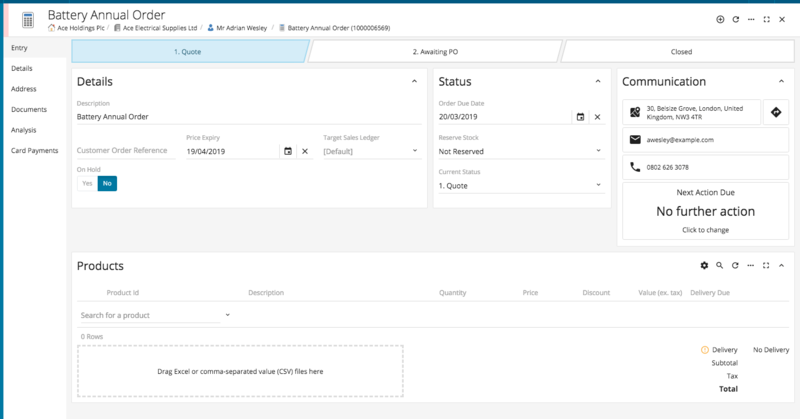 This article outlines how to import products to a Quote record from a CSV or Excel file. Importing products from a CSV/Excel file can dramatically reduce re-keying for your sales team when creating Quotes or orders for customers. 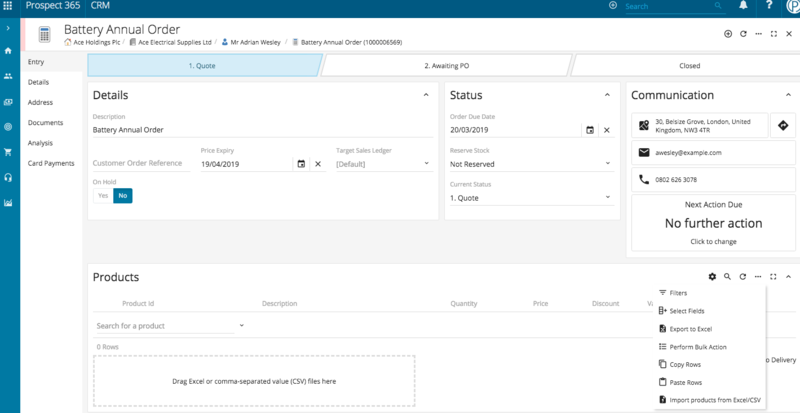 If your customers provide lists of the products required & their desired quantity & better yet in a CSV/Excel format, then this option will be extremely helpful when creating Quotes. Before starting to use the import option I would recommend downloading an example CSV/Excel file so you can see the required format. 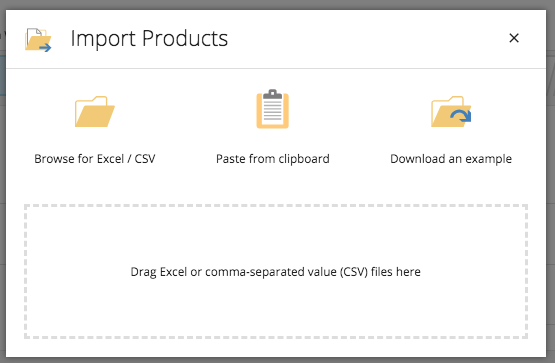 To download an example copy, click on the additional options menu & select the 'Import Products from Excel/CSV' option. You will then be able to click on the 'Download an example' option, which will download an example CSV for you to take a look at. 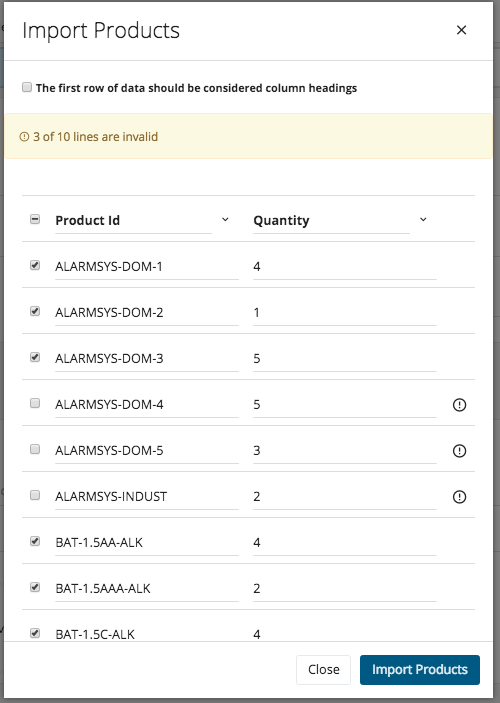 The example CSV has two columns; Product Id & Quantity, these are required in order to import the correct products onto the Quote. The quickest way to upload a completed CSV/Excel file is to drag & drop the file within the 'Drag Excel or comma-separated value (CSV) files here' section on the Quote record. Once you have dragged & dropped the required file, the CRM will try to identity the product Ids & quantities. All product Ids & Quantities will be listed for you to review & unselect any that are no longer required. The CRM will also un-tick any product Ids that are invalid. Once happy with your selection click Import Products & the selected products will be added to the quote record. For more information on creating Quotes take a look at our Creating Quotes Under a Division/Contact article.